When it comes to cool makeup designs, we really have it give it to the Korean beauty brands. There is no shortage of limited edition collections with all sorts of cute packaging that we simply cannot resist to buy. Even as a writer who gets more than enough beauty products to last me until I’m 50 (okay i exaggerate), I’ve succumbed to the likes of Apeach when TheFaceShop dropped a cute collection earlier this year. 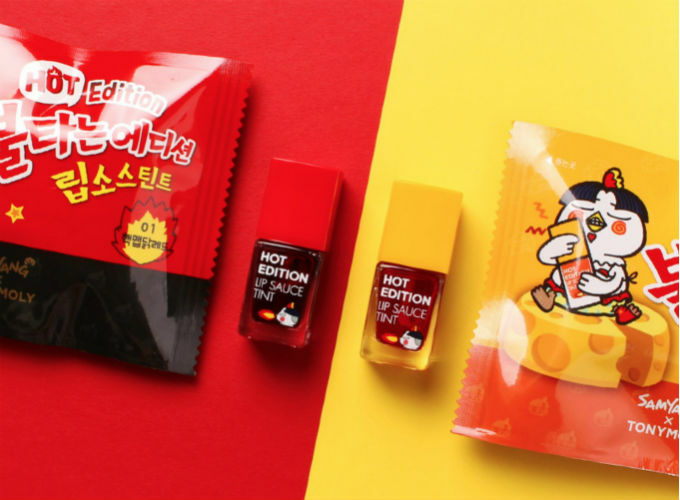 Next up on our radar is TONYMOLY who collaborated with Samyang for a deliciously spicy capsule collection consisting of 5 makeup items. 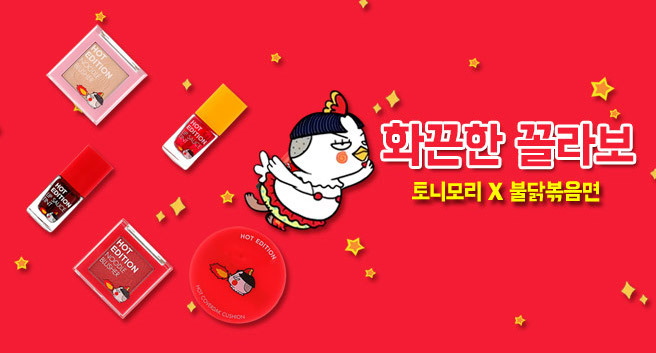 Inspired by Hochi (the chicken mascot) and the popular Hot Chicken Spicy Ramen that even became a global challenge on the internet, the limited edition collection is now available only in TONYMOLY shops in Korea, but you can get it online from Shopee. First up is the super hot edition of TONYMOLY’s cushion compact (pun intended). The red compact comes with an equally vibrant red cushion puff, and the cushion is even engraved with Hochi’s face. Hochi is pretty much the face of Samyang’s Hot Chicken Flavor Ramen, and seeing his face every time you go for a touchup will put a smile on your face. Unfortunately, the cushion compact only comes in two colours – Vanilla and Beige, and they only come in mini-size. These spicy compacts are slightly smaller than your usual K-beauty cushion compacts, although they do pack a punch. Each cushion compact also comes with a refill, and here’s the fun part. The foundation comes in a little packet that looks exactly like the spice and condiment packets that come with your instant noodles! When you think of something spicy, the image of red faces and sweat comes to mind. With TONYMOLY’s new Noodle Blusher, you’ll be able to recreate that flushed look, complete with the shiny trails of sweat. The Noodle Blusher no. 1 is a bright vibrant red for those rosy cheeks. The Noodle Blusher in no. 2 might seem like a pink blush at first glance, but when you swipe it on, it looks more like a highlighter with gold flecks. Finally, the capsule collection also has two lip tints. 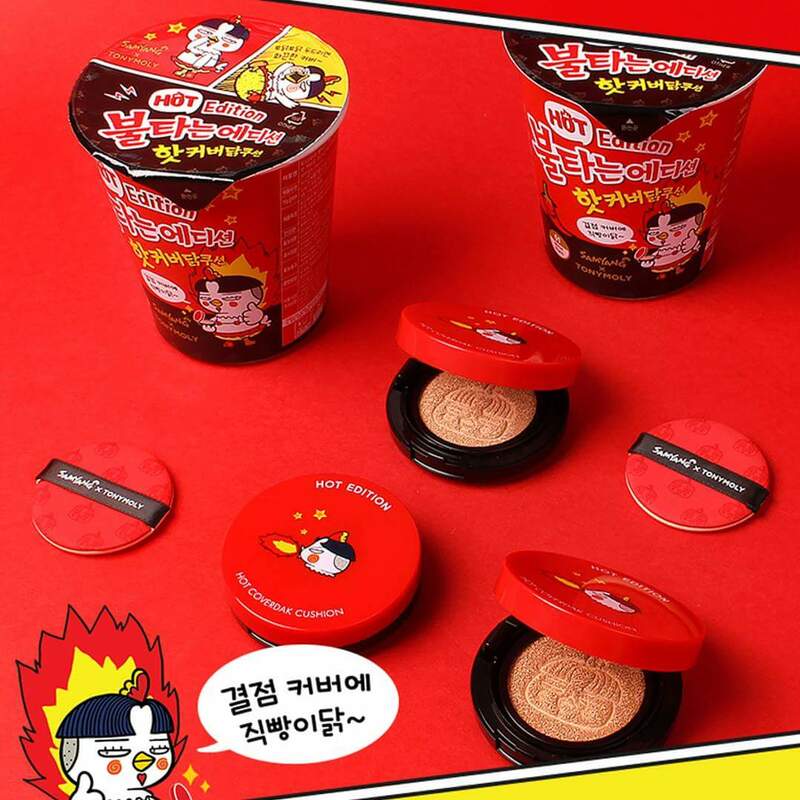 Just like the blushers, your lip tints come in a cute instant noodle-like packaging, with the red one in the trademark red and black packaging, and the yellow one from the cheese variation of the spicy noodles. The Hot Edition Lip Sauce Tint in 01 Spicy Red is an (unsurprisingly) bright red, and it gives you that red flushed lips without the swollen look when you’ve just finished a bowl of that Hot Chicken Flavour Ramen. The other yellow tint reminds us of those chilli oil bottles, and has an orange-y tint to it. Pretty clever huh? The entire collection is now available on Shopee, and if you get the entire set, it even comes with an actual cup of instant ramen just in case you’re craving for it. We know we are. 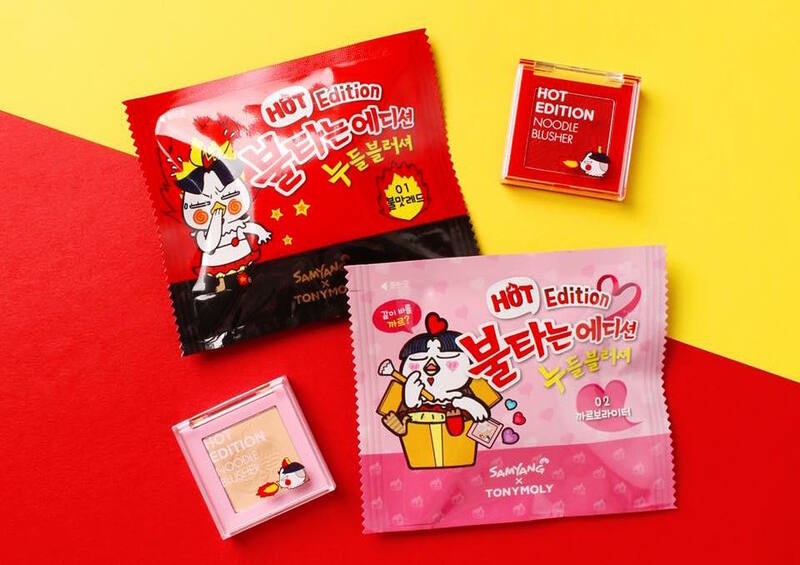 The TONYMOLY Hot Edition & Samyang Fried Noodle Set is now available on Shopee as a full set, or you can get the Hot Coverdak Cushion, Noodle Blusher and Lip Sauce Tint individually.